Maintaining accurate student records is an important part of running an education business. Teachworks has added a new feature to help you keep your student grade levels up-to-date. At the end of the year, changing all of your student’s grades manually could become a very tedious task. This feature will automatically change the grades for you so you can focus on a different aspect of your business. This feature allows you to increment the grade levels for all of your existing students as you transition to a new school year. The feature can be accessed by going to your Students table and clicking the “Increment Grade Levels” link in the sidebar. The form displays a list of all of the grade levels that have been assigned to your students. Next to each grade is a text field where you can enter the replacement value. 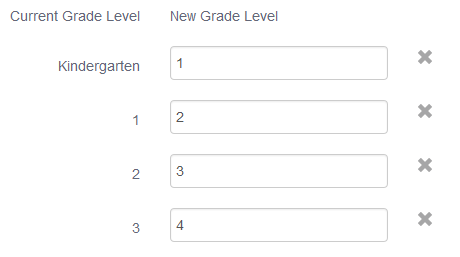 As an example, if you have students with the grade value of “Grade One” you would enter “Grade Two” in the text field to update the grade level for those students. If you find that you have entered student grade levels using different formats such as “Grade 1”, “Grade One” and “1” you can update each of these with a value that uses a consistent format. If you’ve already begun saving student records using the new school year, but you still have student records with grade levels based on the previous school year, you can choose which records to update based on the date that the student profiles were created. For example, if you began using the next school year for all student profiles created after July 1 you would be able to update only the records prior to July 1.